If you already have a foundation in grant writing, Nonprofit Learning Point’s Grant Writing II class can help you take your skills to the next level. Also coming up in the fundraising arena are: Strengthening Oral Presentation Skills to Connect with Your Board, Funders, and the Community, and First Steps to Securing Individual Gifts. See all of Nonprofit Learning Point’s classes here. There are tons of webinars coming up this month on fundraising topics: Expert Advice on Choosing a Donor Management System (3/17), Are You Ready for a Capital Campaign? (3/23), and 10 Secrets to Optimizing Your Online Donation Process for Maximum Dollars Raised and Retained (3/30). We compile a list of free and low-cost webinars in our Weekly Update e-mail. Visit our Communication Subscription page for information on how to register for ConnectVA news. Wild Woman Fundraising is hosting a Virtual Fundraising Career Conference, and the Partnership for Nonprofit Excellence’s very own Abbi L. Haggerty is a presenter! If you are trying to figure out next steps, or get your foot in the door in a development position, check it out! These local professional development membership organizations have a lot to offer: The Grant Professionals Association offers an opportunity to learn from and network with grant writers. At their March meeting, they are going over Federal grant terminology. 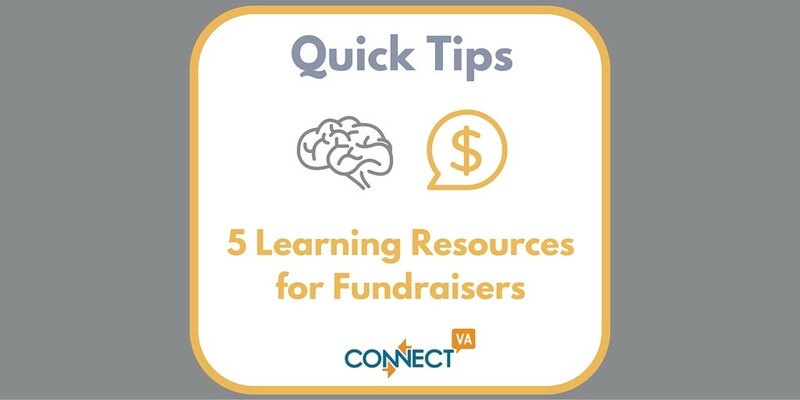 The Association of Fundraising Professionals-Central Virginia Chapter and Virginia Association of Fundraising Executives are also great resources. If you haven’t already, be sure to subscribe to the Grants and Funding Opportunities Discussion Forum thread. You’ll receive an e-mail as soon as a funder posts an opportunity. You can also use the forums to ask questions and share best practices. See a discussion topic that’s missing? We’re looking to add new topics, so we’d love to hear your feedback. We also made some improvements/additions to our Funding Resources pages. Learn about funding and grant information, resources and opportunities.